Monarch Air Group provides private air charter in Turin, Italy. Our clients benefit from top-notch service, unrelenting dedication to safety, wide selection of aircraft, and years of experience in chartering private jets. To obtain a free quote, please use our online quoting tool provided below, or call toll free 1-877-281-3051. Monarch Air Group provides private jet charter flights in and out of Turin, Italy. Located 78 miles southwest of Milan, 76 miles northwest of Genova, and 165 miles west of Verona, Turin is a city in northwestern Italy and the capital of the Region of Piedmont. It is well known as the automobile capital of Italy with the Fiat Group based here, and also, as the place of the 2006 Winter Olympic Games. 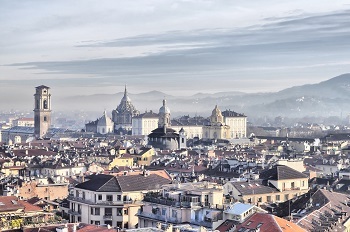 Turin is a cultural, commercial, industrial center and one of its major economic engines. The city’s economy is mainly supported by engineering, electronics, food, publishing and printing, textiles, steel, rubber, banking, agriculture, ICT sectors and insurance. Turin is home to some large companies such as Bertone, Dayco, Italdesign-Giugiaro, Istituto Bancario San Paolo, Pininfarina, Sai, and some others. It is also home to the University of Turin, founded in 1404, and several other universities. Turin is a beautiful travel spot filled with historic palaces, beautiful churches, breathtaking tourist attractions, unique squares, great cafes and luxurious restaurants. The most notable tourist attractions include the Mole Antonelliana, the Egyptian Museum, the Residences of the Savoy, the Church of the Consolata, the Porte Palatine, the Cathedral of St. John the Baptist, the Basilica of Superga, the Parco del Valentino, the Piazza San Carlo, and the Piazza Castello. Often called “The Capital of the Alps,” Turin lies at the foot of the Alps and offers various recreational opportunities including beautiful nature reserves and lakes, and world class skiing facilities. With its vast cultural and artistic heritage, rich diverse history, mountains and scenic landscapes, Turin attracts both business and leisure travelers from all over the world. The city is served by Aosta Airport (AOT), Turin-Cuneo Levaldigi Airport (CUF) and Turin International Airport (TRN).